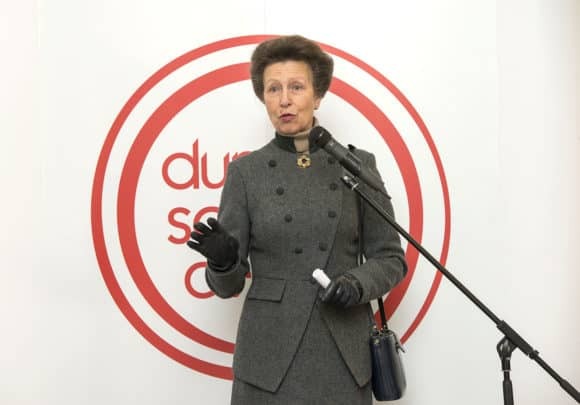 The Medical Research Scotland ‘Meet the Researcher’ Showcase, which was attended by its Patron, HRH The Princess Royal, aims to inform and enthuse senior school pupils about medical research and the diverse range of careers open to them. The event also demonstrated Medical Research Scotland’s commitment to supporting the scientists it funds, who are at the earliest stages of establishing their careers, and promoting collaborative work between academia and industry. Over 30 pupils and their teachers from schools throughout Dundee, Angus, Perthshire, Fife and Edinburgh enjoyed careers talks from Professor Bill Hunter, Professor of Structural Biology at the University of Dundee and Dr Vanessa Duncan, Senior Research Associate, Novabiotics Ltd. They also had the chance to informally network with a group of 12 Medical Research Scotland funded researchers from universities across Scotland, and hear more about their work and their careers. The research topics on show ranged from neurodegenerative diseases and tissue imaging to cancer treatments and the next generation of medical devices. Pupils also had the chance to interact with the University of Aberdeen Marine Biodiscovery Centre’s ‘Build a Medicine’ exhibit, while the Institute for Medical Science and Technology (IMSaT) in Dundee brought their endoscope and model gut. Schools represented were: Grove Academy, Dundee; Morgan Academy, Dundee; Breadalbane Academy, Aberfeldy; George Watson’s College, Edinburgh; St Leonards School, St Andrews; Waid Academy, Anstruther. Medical Research Scotland is one of Scotland’s largest, independent charitable funders of biomedical & clinical research. Originally established in 1953 by Act of Parliament as “The Scottish Hospital Endowments Research Trust”, it became a fully independent Scottish charity in 2006 and is now known as “Medical Research Scotland”. Her Royal Highness The Princess Royal has been its Patron since June 2008 and its Chairman is Professor Philip Winn.